I just made this Inkscape beginners tutorial on how to make a sign. This is my first attempt at a video tutorial. Any feedback would be appreciated. Last edited by 3dnett on Wed Nov 22, 2017 9:51 am, edited 1 time in total. Curious why you're not using the current stable version (0.92)? For a beginner tutorial, I would have the canvas set up to View menu > Default. Rather that switch between the docked dialogs, I would open from either a menu, or a command bar button, so a beginner knows where to find them. Or else, explain how you set up the docking area. A lot of fancy video effects in there. To me, they're a bit distracting....but heck, I'm old. Probably the captions are going by too fast. I can follow, because I know Inkscape pretty well. But I still had to stop and rewind a few times. A newbie would need it slower. Thank you for your reply! You make some good points. I will make some changes accordingly. I was a bit insecure about how fast I should run the captions. Will slow them down a bit. Maybe I will tone down the effects too, we'll see... Also I will change to default view. My goal is to make it as understandable as possible for a novice, have no feedback from any newbies yet. Yes, if you use text a lot in Inkscape, that bug would be a problem. It's not fixed yet. I thought he was describing the line height issue, which is indicated near the bottom of the download page as a known issue. But truly, it's hard to say, without more detailed info. Thank you for your interest guys. 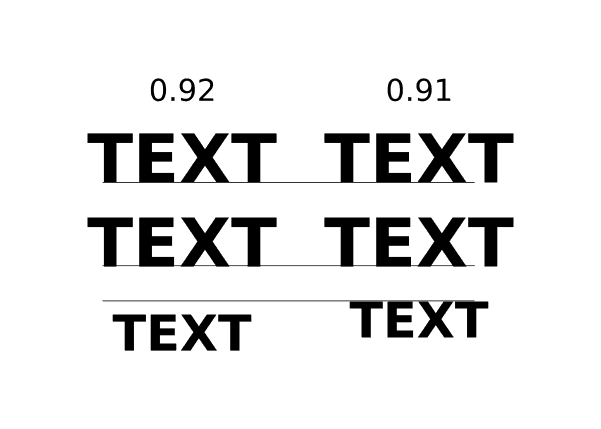 Here is a picture of the difference in default text rendering between 0.91 and 0.92. Is it supposed to be like that? Can you share a file, please? Was the file originally created with 0.92 or 0.91? And - which 0.92 are you using? The current one, 0.92.2? Moini wrote: Can you share a file, please? Was the file originally created with 0.92 or 0.91? And - which 0.92 are you using? The current one, 0.92.2? Sorry I couldn't get back to you sooner. Yes, I am using the most recent version 0.92.2, that image was a construction. Here are direct links to two SVG sample-files I just created in each version of Inkscape. File names corresponds to the Inkscape version of its origin. They already look different in a browser. Is that what you mean? Or do you mean that a single file looks different if opened with different Inkscape versions? The two different versions of Inkscape produce different text with same settings for fonts, line height etc. I work as a sign maker/sign designer. Often you will need to squeeze in as much info as possible on an limited amount of space. A massive white-space between the lines when you combine different font-sizes is unwanted. Of course, if you break the text apart you can distribute the lines with equal amount of space, but that is time consuming. I really hope this is a bug(I think so) and not a feature... For me though it's not critical as I mostly use Corel at work, but I guess for many other it might be frustrating. Thanks btw, for taking an interest in this. Thank you! This was helpful. So it's not a bug then.. A bit confusing at first, but I guess in the end it gives you better control. I figured that if you set the style of the Outermost text element to the smallest font in use you'll get similar result as in the pre-0.92 versions. The user interface will be changed in Inkscape 0.93 (it will offer some useful presets - although, admittedly, I haven't been able to make them work as expected yet...). That's exciting news. Those presets will probably come in handy. It's frustrating when code don't behave as expected, I hope you'll get it working right eventually. I'm greatful for all the hard work you and others put in to make this amazing software. I often switch over to Inkscape at work because it can do stuff that Corel can't do without add-ons. Oh, I mean that, as a user, I haven't been able to make them work like I think they were intended by the developer. I hope that Tavmjong Bah, who worked on it, will still improve it.